The IEEE 802.15.3 medium access control (MAC) is proposed, especially, for wireless personal area network (WPAN) short and high data rates applications, to coordinate the access to the wireless medium among the competing devices. A concept of a geometrically increasing probability distribution for contention process was brought up in the work of Tay et al. (2004). In this paper, we adopt this idea as improved backoff (IB) for contention process of IEEE 802.15.3, where binary exponential backoff (BEB) is originally used. Here, we propose an analytical model for IB and compared both BEB and IB for saturated and nonsaturated traffic conditions. Furthermore, our research results demonstrate that IB provides an edge over BEB in terms of channel efficiency, channel access delay, and energy efficiency. The IEEE standard 802.15.3 MAC or WPAN MAC layer  is based on a centralized, connection oriented topology which divides a large network into several smaller ones termed "piconets." A piconet consists of a Piconet Network Controller (PNC) and DEVs (DEVices). One DEV is required to perform the role of PNC (Piconet Coordinator), which provides the basic timing for the piconet as well as other piconet management functions, such as power management, Quality of Service (QoS) scheduling, and security. The standard also allows for the formation of child piconets and neighbor piconets. In IEEE 802.15.3 MAC protocol, the channel time is divided into superframes, where each superframe beginning with a beacon. The superframe is composed of the three major parts: the beacon, the optional contention access period (CAP), and the channel time allocation period (CTAP) or channel time allocation time (CTA). Wireless channel is usually vulnerable to errors. Hence, error control mechanism is an essential part of any MAC protocol design. In accordance with that, IEEE 802.15.3 standard defines three types of acknowledgment mechanisms for CTAs and CAPs: the No-ACK, Imm-ACK, and Dly-ACK mechanisms . During the CAP time devices request for reservation in CTA and also send data packets if needed. So the time length of CAP is dynamic and it is determined by the PNC. Longer the duration of CAP time is, more the number of devices will send their CTA slot requests and causes less time for CTA slots. Hence, it is important to improve the performance for both data and request packets transmission within limited time frame of CAP. In our previous work  we present the detail performance analysis of WPAN MAC and identified some key issues to improve the MAC performance, especially, for CAP duration. In this paper, we limit our research focus on improving the performance of CAP using IB instead of BEB during the contention process, and hence, overall WPAN MAC performance. During the CAP, MAC protocol performs backoff procedure before transmitting any kind of data or request packets. This backoff mechanism is similar to CSMA/CA mechanism of IEEE 802.11 with some different parameters. In WAPN MAC, retry count is limited up to 3 counts (0 to 3) with maximum window size of 64 slots (8, 16, 32, and 64). To the best of our knowledge, there is no work on the performance or channel analysis of IEEE 802.15.3 networks with respect to contention-based scheme during the CAP time. However, a large amount of literature is available on IEEE 802.15.3 MAC scheduling, optimization of superframe size, and various traffic analyses. Some of the important related works are as follow. In  the authors presented the implementation of IEEE 802.15.3 module in ns-2 and discussed various experimental scenario results including various scheduling techniques. Specially, to investigate the performance of real-time and best-effort traffic with various super frame lengths and different ACK policies. 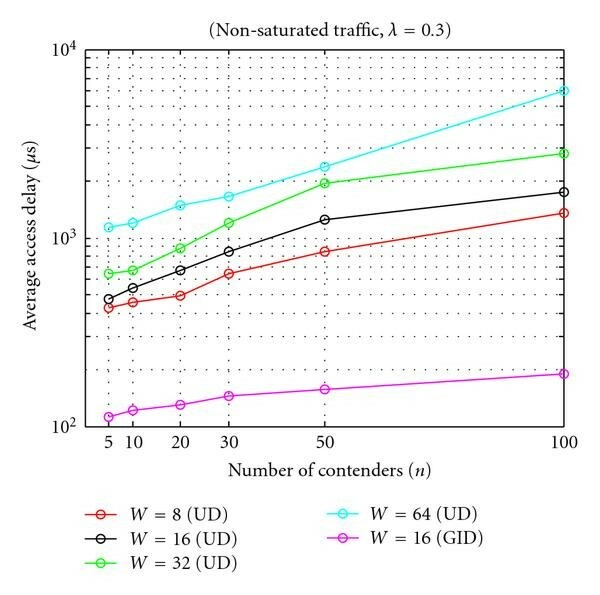 In  the authors presented two adaptive Dly-ACK schemes for both TCP and UDP traffic. The first one is to request the Dly-ACK frame adaptively or change the burst size of Dly-ACK according to the transmitter queue status. The second is a retransmission counter to enable the destination DEV to deliver the MAC data frames to upper layer timely and orderly. Similarly, the work presented in  also discussed about different acknowledge schemes and optimization of channel capacity. Both papers [4, 5] laid a good foundation in simulation and analytical works of IEEE 802.15.3 MAC protocol. In  the authors formulated a throughput optimization problem under error channel condition and derive a closed form solution for the optimal throughput. Similarly, in  the authors presented a detailed performance analysis of WPAN with different designing parameters as well as with different ACK policies and aggregation method. In summary, in our knowledge, this is the first attempt to analyze and compare both the IB and BEB schemes in the contention process of WPAN MAC. Even though the basic idea of IB is adopted from  the main contributions of this paper are as follows. To apply the geometrically increasing distribution as IB to IEEE 802.15.3 MAC. To introduce Markov Chains for BEB and IB in WPAN MAC. 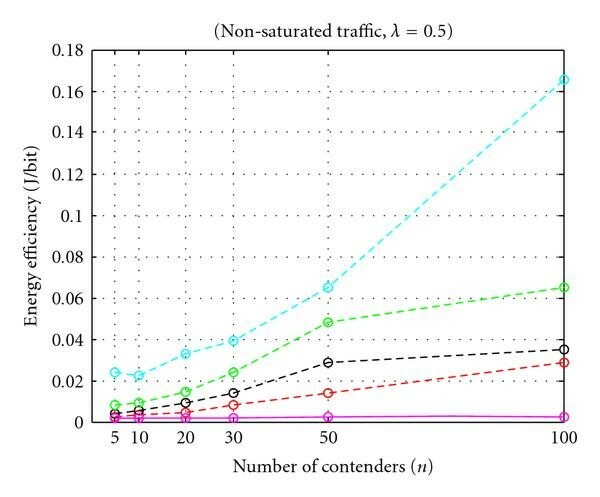 To model the saturation and nonsaturation traffic conditions. To present a comparison of BEB and IB for a medium access scheme. To present the detail performance evaluation study in terms of channel efficiency, channel access delay, and energy efficiency to compare BEB and IB. The rest of the paper is outlined as follows. In Section 2 we describe the BEB and IB medium access schemes. In Section 3, we present the analytical modeling of BEB and IB schemes and in-depth performance analysis in Section 4. Finally, conclusions are drawn in Section 5. BEB-based carrier sense multiple access with collision avoidance (CSMA/CA) is the most basic and widely used mechanism for MAC protocol. In WPAN MAC, if the channel is idle for backoff interframe space (BIFS) or short interframe space (SIFS) the DEV starts executing the BEB scheme. At each packet transmission, the backoff counter is uniformly selected from the given range of [0, CW-1] (in rest of the paper we keep using terms "DEV" and "node" interchangeably). Here, CW is known as contention window and its value depends on the number of failed transmissions for the packet. At the first transmission attempt, CW is set to minimum value of 8 and if transmission attempt fails then its value gets double, and again set to minimum value on successful transmission. In WPAN MAC, the maximum contention window value is set to 64 with the maximum retry limit up to 3 counts. After selecting CW node decrement its value by 1 as long as channel is sensed idle and freeze its value when channel is sensed busy. By using BEB method MAC protocol attempt to adapt to the active population size of contending DEVs. However, this method has several disadvantages as follows. Traditional backoff takes time for (Contention Window) CW to correctly adapt to the right value when the active population (of nodes) is large(here, traditional backoff procedure means CSMA/CA scheme with binary exponential backoff (BEB), unless and otherwise specified). The MAC protocol latency performance is high if CW is large. A station that successfully transmits resets its CW to a small, fixed minimum value of CW. Consequently, the node has to rediscover the correct CW, wasting some precious bandwidth. Traditional backoff algorithm could not take the advantage of shared learning when number of nodes is increasing. 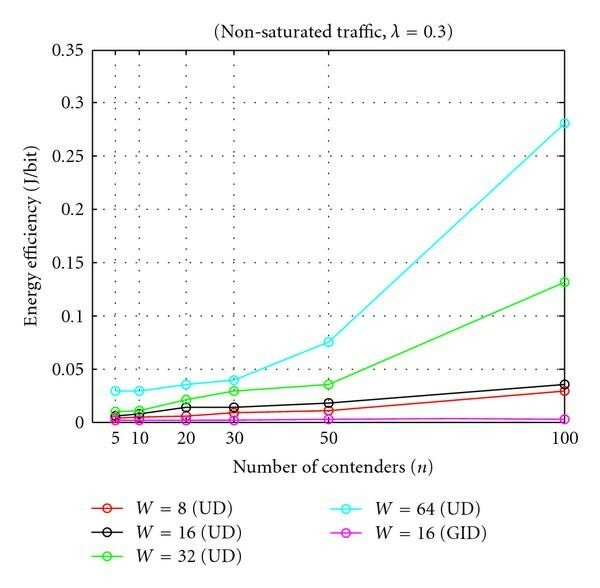 Traditional back-off's success probability degrades with increasing number of nodes. Traditional back-off is also not suitable for power saving networks' application. Our results from  also support the aforementioned disadvantages. Figure 1 shows the throughput for different number of active nodes. It can be seen that throughput decreases as the number of active nodes increases due to increase in collision probability and channel access time. Throughput versus number of active nodes (this result is taken from [ 2 ]). 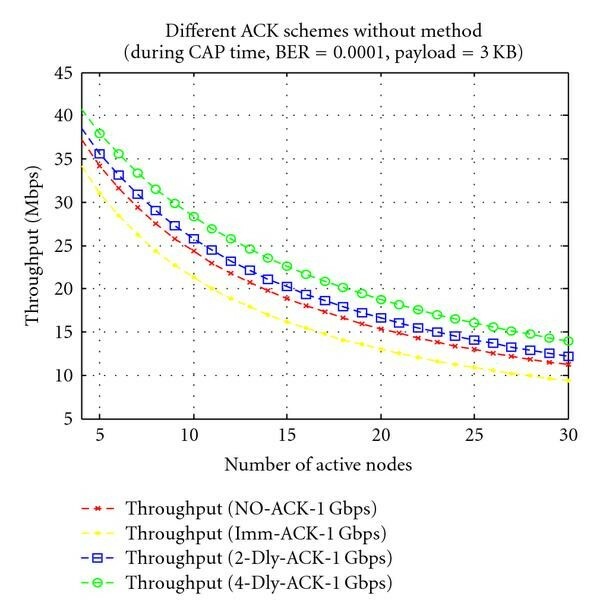 In nutshell, during the CAP, backoff window size and the number of active nodes are the major factors to have impact on the throughput performance. The BEB scheme does not work well when we are interested in the high bandwidth utilization, latency, and energy efficiency. These observations and result lead us to use new medium access scheme for IEEE 802.15.3 MAC. 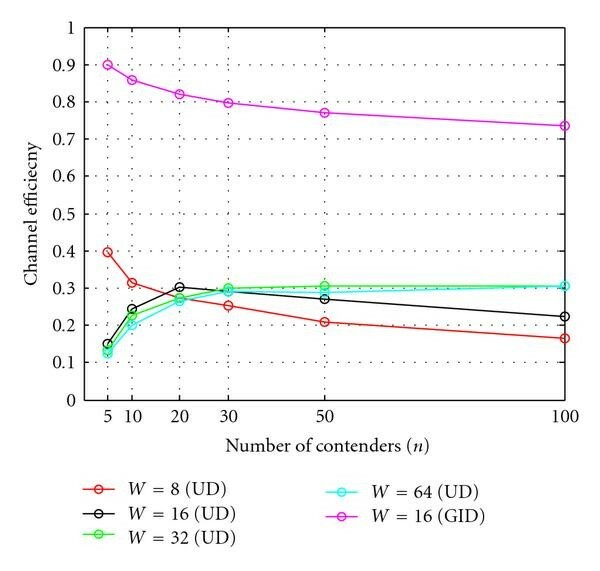 So to improve the channel performance during the CAP time, we use a fixed-size contention window, but a nonuniform, geometrically increasing probability distribution for picking a transmission slot in the contention window interval. In contrast to BEB scheme, IB scheme uses a small and fixed CW. In IB scheme, nodes choose nonuniform geometrically increasing probability distribution (P) for picking a transmission slot in the contention window. Nodes which are executing IB scheme pick a slot in the range of (1, CW) with the probability distribution P. Here, CW is contention window and its value is fixed. More information on CW we will be presenting in the later sections of this paper. 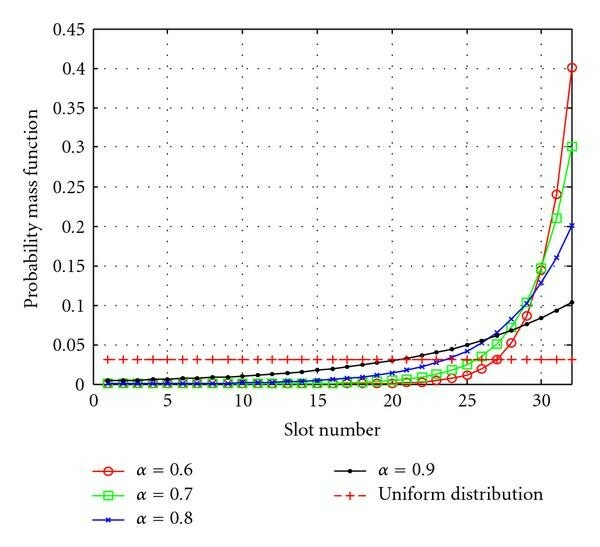 Figure 2 shows the probability distribution P. The higher slot numbers have higher probability to get selected by nodes compared to lower slot numbers. In physical meaning we can explain this as follows. At the start node select a higher slot number for its CW by estimating large population of active nodes (n) and keep sensing the channel status. If no nodes transmit in the first or starting slots then each node adjusts its estimation of competing nodes by multiplicatively increasing its transmission probability for the next slot selection cycle. Every node keeps repeating the process of estimation of active nodes in every slot selection cycle and allows the competition to happen at geometrically decreasing values of n all within the fixed contention window (CW). Difference between uniform and truncated geometric distributions. In contrast to the probability distributionP, in uniform distribution, as shown in Figure 2, all the contending nodes have the same probability of transmitting in a randomly chosen time slot. From Figure 2, in the probability distributionP, we can depict that when the population of competing nodes (n) is large, most of the nodes will choose medium to higher slot numbers of CW before accessing the channel and a very few nodes will choose low slot numbers, hence, a collision-free transmission will take place in lower slot numbers. When n is medium, most nodes will choose higher slot numbers and a collision-free transmission will take place in medium slot numbers. Similarly, when n is small, a collision-free transmission will take place in higher slot numbers. Thus for any value of n, and for any fast change in n, a collision free transmission can take place. These special characteristics of IB give the advantage over the BEB in terms of different performance metrics. If only one node gets the chance to select the contention slot within the fixed CW, it will transmit in that slot. 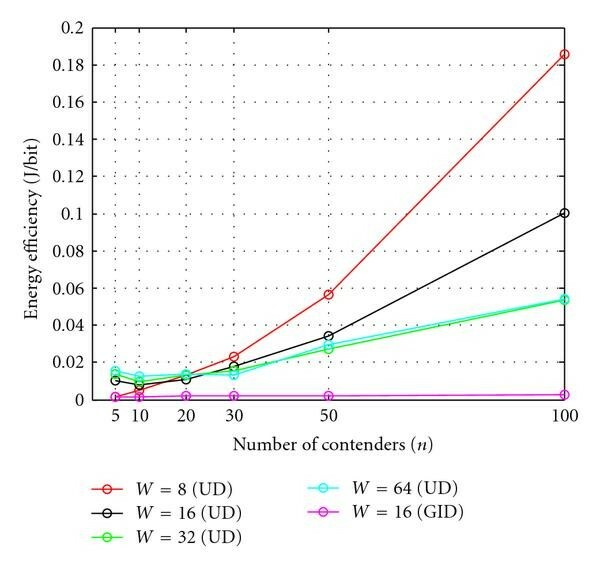 While other nodes will select new random contention slots for next contention process, to win channel medium, regardless of success or failure of transmission of winner node. where is a distribution parameter. In this range of increases exponentially with , so the later slots have higher probability. Here, it is worth to note that IB scheme does not use timer suspension like in IEEE 802.11 to save energy and reduce latency in case of a collision. The only problem with the IB is fairness, however, for WPAN MAC, especially, during CAP fairness is not an issue as every node do not have request packet for PNC for every time. For the general wireless communication scenario we need fairness mechanism, which we left to our future research investigation. In this section we present the general frame work to model the backoff algorithms. This frame work basically consists of three steps: finding the attempting probability for a node in backoff, finding the transition probability for a given channel state, and model the stationary probabilities of the channel state for required protocol details. Here we also model channel efficiency, channel access delay, and energy efficiency with these three basic steps (In this paper, we use terms "algorithm," "scheme," and "method" interchangeably. Most of the studies on backoff algorithm (BA) are focused on the stability issue rather than performance analysis of backoff algorithm. In this paper our main focus is to analyze and compare the performance of both IB and BEB with respect to network load in steady-state condition. Here, we define network load in terms of the number of nodes that are contending for the access medium. Another approach is to consider total arrival packet rate to the network as an offered load. The main purpose of BA is to reduce the effect of contention among the nodes and try to adopt the population of nodes so the number of nodes contending for medium is a more favorable way to define an offered load for analyzing BA. Here, we assume a fixed number of nodes in saturated and nonsaturated conditions. Saturation conditions mean every node always has a packet to transmit and similarly in nonsaturation case every node receives a packet with probability . More on saturation and nonsaturation will be explained later. The channel is an ideal and introducing no errors to the reception of a packet other than collision. Also, capture effect is not considered. The BA performed in a time-slotted fashion. A node attempts to attain the access the channel only at the beginning of a slot. Furthermore, all nodes are well synchronized in time slots and propagation delay is negligible compared to the length of an idle slot. In BEB, at first transmission, a packet is transmitted after waiting for the number of slots randomly chosen from the given range of contention window ( ), where is the minimum contention window size. This contention window is used as time unit for a node to detect the transmission of a frame from any other node. This time unit is defined as "slot time." We model the operation of BEB at an individual node using the state diagram shown in Figure 3. This diagram is based on the models presented in [8, 9] including the freezing and retry limit parameters. 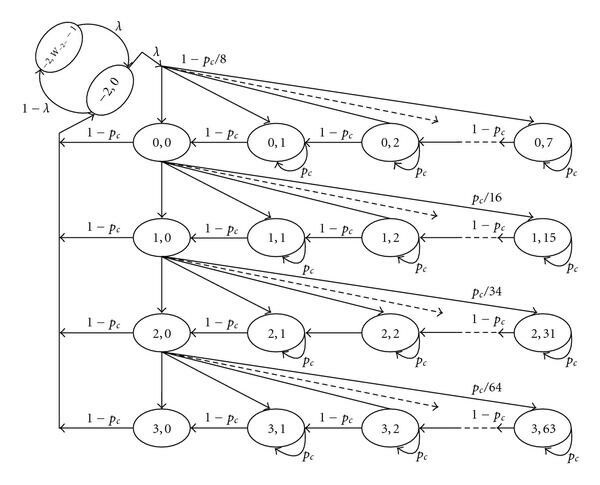 Markov Chain Model for IEEE 802. 15.3. The first equation in (2) indicates that at the beginning of each slot time, the backoff counter is decremented if the channel is sensed idle. The second equation shows that the backoff counter is frozen if channel is sensed busy. The third and fourth equations, respectively, indicate that following an unsuccessful transmission, the node backoff stage selects a backoff interval uniformly in the range of (0, ) and when the backoff stage reaches , stays constant. The rest of the equations shows the transition probabilities for two extra sates we added. Here, we take to introduce 2 extra states. These transition probabilities are straightforward to understand, as shown in Figure 3. Markov Chain for IB Method. The first equation in (3) indicates the backoff counter which is decremented if the channel is sensed idle. The second equation indicates that the node defers the transmission of a new frame and enters stage 0 of the backoff procedure if it detects a successful transmission of its current frame or finds the channel busy or if it detects that a collision occurred to its current not successfully transmitted frame. The third equation indicates that the node selects a backoff interval nonuniformly in the range of (1, CW) following an unsuccessful transmission. Here, n denote the number of nodes. Equations (4) and (6) are from a nonlinear system with two unknowns and . This nonlinear system can be solved using numerical methods. Figure 5 shows the plot of as a function of with various values of CW and n. This graph is plotted with m, the retry limit equal zero. As shown in Figure 5 the unique intersection of (4) and (6) gives us the value of and for given CW and n. The plot shows and converging to 0.5 and zero, respectively, as the number of nodes increases . Similarly, we can obtain the solution for and when retry limit, , is and traffic condition is nonsaturated (i.e., ) (more information on this is discussed later). 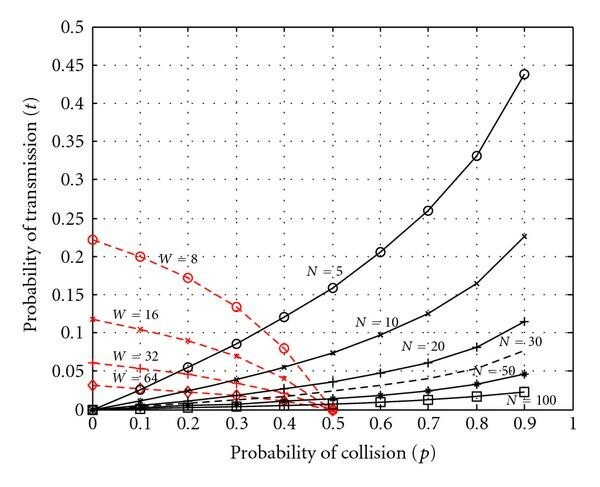 Probabilities of transmission and collision. Energy efficiency model is valid for both BEB and IB methods. The channel efficiency is mostly depending on number of active nodes and contention window size. As shown in Figure 6 BEB scheme is plotted for different values of CW and IB is plotted for fixed value of CW = 16. 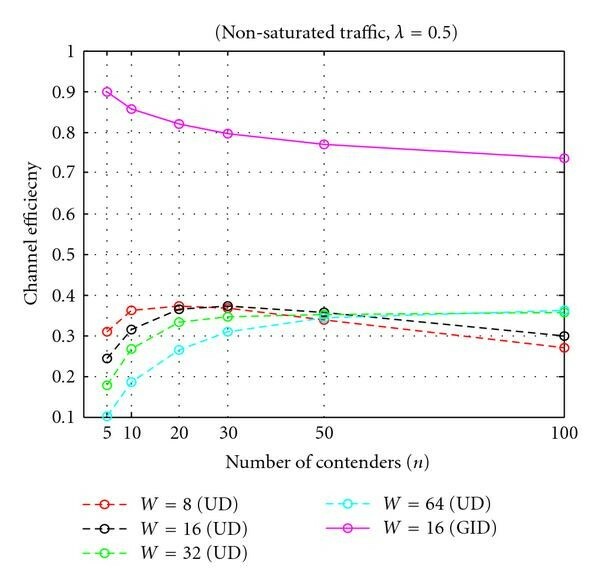 We investigated various values of CW and n for IB and found the CW = 16 is the most suitable value to get best delay and energy efficiency performances while maintaining the channel efficiency above 70% for the given number of nodes. As shown in Figure 6, for BEB (all BEB graphs are caption with Uniform Distribution UD and IB graph is caption with: Geometrical Increasing Distribution GID.) scheme, results with CW = 8 and 16 give high channel efficiency values at lower number of nodes. The reason is very obvious, less collision and low waiting time in backoff procedure, and as the number of contenders increases channel efficiency starts decreasing. For CW = 32 and 64, first graphs show lower channel efficiency, then increase to higher values, and later maintain nearly constant values. This is because first CW is too big for given number of nodes and later it adjusted with the number of nodes, hence, nearly constant collision and waiting time in backoff procedure. In contrast to BEB, IB maintains high channel efficiency due to its unique quality of collision avoidance among the competing nodes. 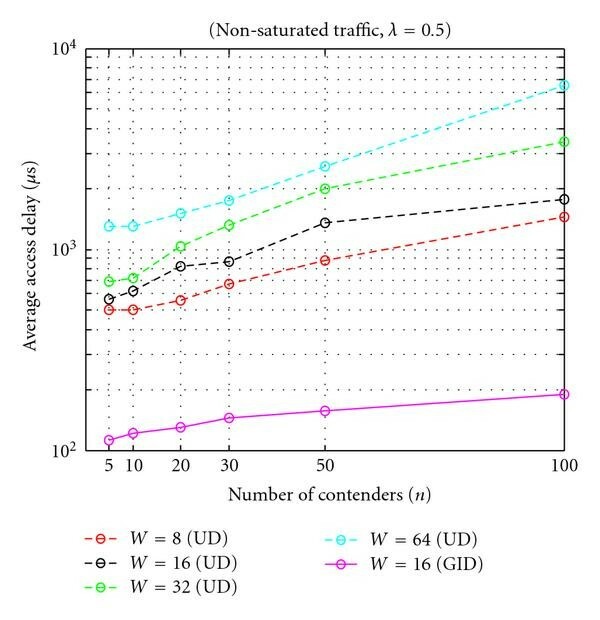 In IB most of the nodes choose higher contention slots while very few nodes selects lower contention slots, hence, less or no collision and low waiting time in backoff procedure. It is worth to note that BEB is executed under the saturation condition (i.e., ), where all the nodes are always ready to compete with each other, hence, increase in collision probability. In IB, every node does not compete with each other every time, as they do not have request packet to send to PNC for every superframe (i.e., nonsaturated traffic). So we compare the BEB with IB under the nonsaturation condition as shown in Figures 7 and 8. Number of contenders versus channel efficiency. Number of contenders versus channel efficiency (Lambda = 0. 5). Number of contenders versus channel efficiency (Lambda = 0. 3). Results shown in Figures 7 and 8 are similar to those in Figure 6 except for CW = 8. In the nonsaturation case, especially for low n, competition for cannel access is low so the graph for CW = 8 is initially starting from low value, reaching to maximum, and again it starts decreasing. 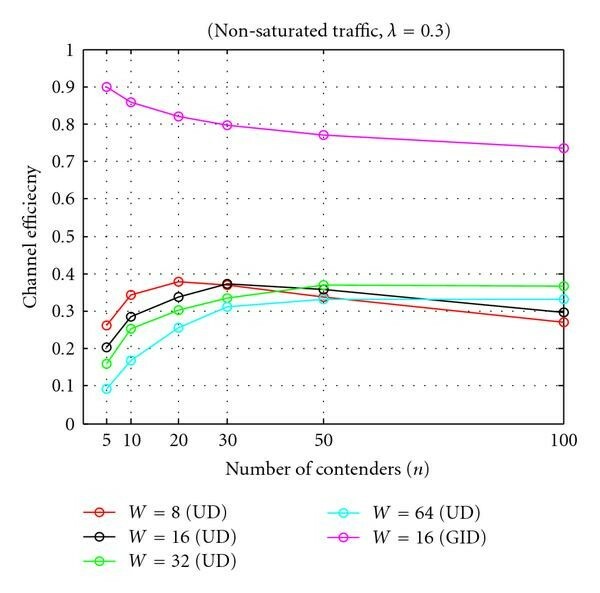 Form these figures we can also fine the optimum value of CW for given a value of n.
Figures 9, 10, and 11 show the average medium access delay performances of BEB and IB for saturation and nonsaturation traffic, respectively. In BEB scheme, as a large number of stations attempt to access the medium, more collision occurs so the number of retransmissions increases and the nodes suffer longer delays. The BEB scheme is plotted for different values of CW. Figures 10 and 11 show some interesting results, the graphs for CW = 64 show maximum average delay unexpectedly. This is because at nonsaturation condition a node has to wait for longer contention time compared to other CW values. In IB, as we expected access delay is very low compared to BEB. This is because of low or no collision and less idle waiting time in backoff procedure. 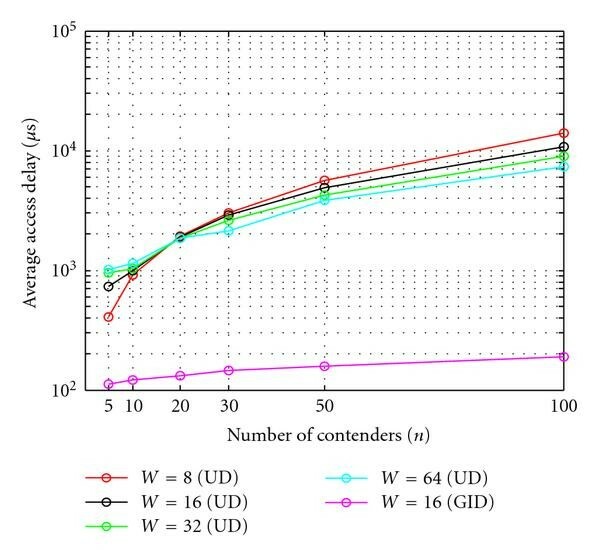 Number of contenders versus average access delay. Number of contenders versus average access delay (Lambda = 0. 5). Number of contenders versus Average access delay (Lambda = 0. 3). Figures 12, 13, and 14 illustrate the effect of bakeoff schemes on energy efficiency under the saturation and nonsaturation conditions, respectively. From Figure 12 we can see that small value of CW in BEB scheme wastes more energy, as collision and number of retransmission increase. As CW value increases the collision probability and the number of retransmissions decreases, hence, we have less energy waste. From Figures 13 and 14 we can observe that the results for in BEB scheme waste more energy compared to other CW vales, as idle listening and overhearing increases. In contrast IB wastes very less energy due to its unique characteristics of collision avoidance. Number of contenders versus energy efficiency. Number of contenders versus energy efficiency (Lambda = 0. 5). Number of contenders versus energy efficiency (Lambda = 0. 3). In WPAN MAC, due to much smaller minimum contention window and the retry limit , the collision probability could be very high when n is large. The request packets are more likely to drop and thus fewer requests can be successfully transmitted. If the request packets are dropped in the cap, the nodes need to reinitiate the request packets in the following superframe, which degrades the network performance due to waste of network resources by retransmission and collision. Accepting IB as backoff scheme can increase the overall performance of WPAN MAC protocol to a large extends as shown in the aforementioned results. In this paper, we present the in-depth mathematical analysis of BEB and IB methods for WPAN MAC to evaluate the performance of a WPAN. Form the obtained results we can tune the value of CW if we know the population of n. In case of WPAN MAC where PNC controls the piconet, it is possible to know the number of contenders available in a network. The analysis presented in this paper is an analysis of BEB with an assumption of steady sate. A sudden change of the offered load will cause change of the state; however, IB can easily absorb the new change with stability. So the analytical model of IB presented in the paper is easily applicable to large-scale sensor networks to improve the latency and energy efficiency while maintaining a good throughput. Furthermore, it is also possible to extend our models for erroneous channel conditions and general wireless networks (i.e., IEEE 802.11) with a proper fairness mechanism. In this paper, we applied IB scheme to WPAN MAC to enhance its performance. We have also proposed the analytical models to compute the performance of BEB and IB in WPAN MAC. Using the proposed analytical models, we analyze the performance of BEB and IB in terms of channel efficiency, channel access delay, and energy efficiency under the saturation and nonsaturation traffic conditions. Furthermore, our results show that IB exhibits an edge over BEB in WPAN MAC.